The last recipe of 2017. Wow, what a year. The older I become, the years seem to go by more and more quickly. It doesn’t feel like it’s time to welcome 2018, yet here we are. So that’s what we’re gonna do. This 6-ingredient cocktail is my new favorite thing. 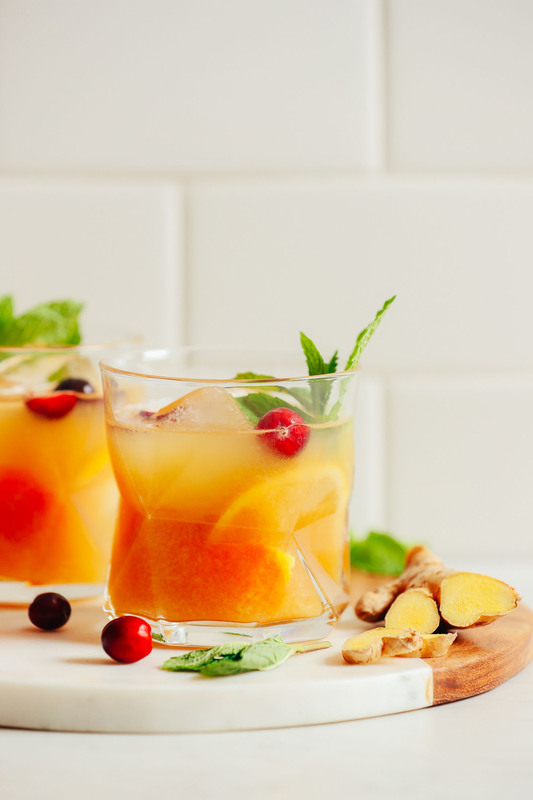 It combines all of my favorite flavors: citrus, ginger, orange, and bourbon. It’s like they belong together. Who are we to keep them apart? Orange peel is muddled with fresh ginger juice, lemon juice, maple syrup, and bitters. Then comes ice and bourbon and a vigorous shake or stir before serving over ice. That’s it! And your perfect New Year’s Eve (or everyday) cocktail is ready. For garnish, I went with fresh mint, lemon wedges, and a few cranberries for a festive touch, but it’s entirely up to you! I could also see pomegranate or candied ginger being delicious additions. Cheers! This would make the perfect cocktail for New Year’s Eve celebrations and beyond. It’s also my favorite “Yay! I made it to Friday again” celebration drink. What I’m saying is, no matter the occasion, this drink delivers. If you’re looking for more cocktails, also be sure to check out our Ginger Beer Margaritas, Sparkling Pomegranate Margaritas, St. Germaine Pomegranate Spritzers, Pear and Cranberry Champagne Cocktails, and Winter Bourbon Smash. If you try this cocktail, let us know! Leave a comment, rate it, and don’t forget to tag a photo #minimalistbaker on Instagram! We’d love to see what you come up with. Cheers, friends! Orange-infused whiskey ginger with fresh lemon and ginger juice. 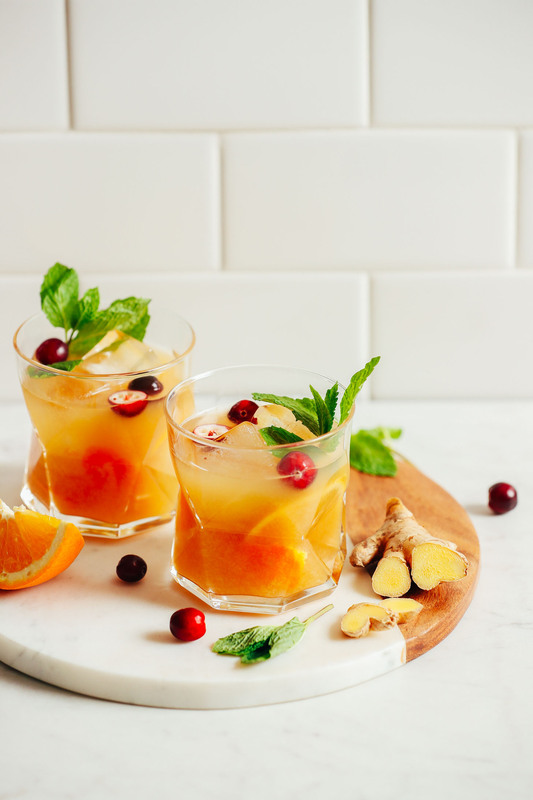 Naturally sweetened, zesty, citrusy, and perfect for the holidays and beyond! Run orange peel around the rim of your serving glass. Then add peel to a small pitcher or cocktail shaker along with ginger juice, maple syrup, lemon juice, and bitters. 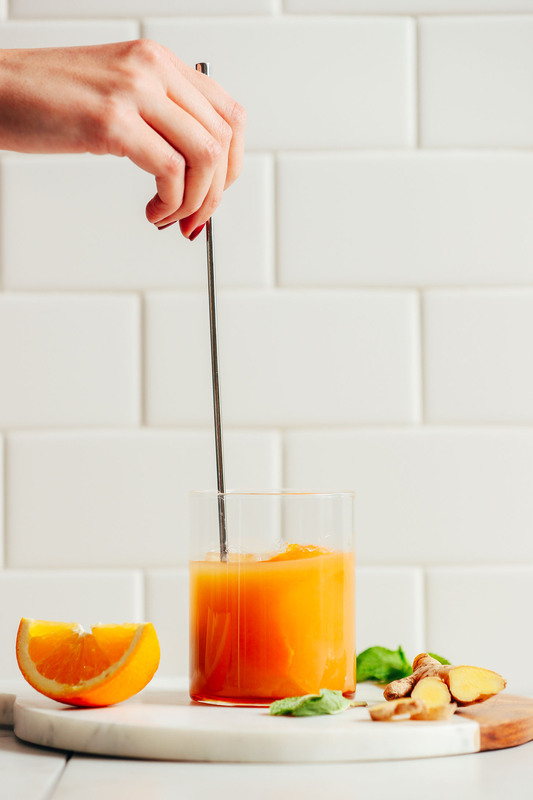 Use a muddler (or a spoon) to muddle/meld the orange peel with the other ingredients - about 1 minute. Next, add bourbon and ice and stir or shake vigorously to combine - about 30 seconds. Pour over serving glass with 3-4 ice cubes. To dilute slightly, top with a dash of sparkling water (optional). For a more festive touch, you could also top with champagne (optional). Garnish with fresh mint and cranberries (also optional). To multiply this recipe, prepare in a large pitcher and multiply ingredients by number of servings desired. Will keep stored in the refrigerator up to 24 hours (don’t add ice before serving or it will dilute the cocktail). *1/2 ounce ginger juice is equal to approximately 1 Tbsp. *2 ounces bourbon whiskey is equal to approximately 4 Tbsps. *To make ginger juice, add roughly 1 cup (100 g) chopped fresh ginger and 1/2 cup (120 ml) water to a small blender or a food processor (I used my Magic Bullet). Then blend until completely combined, and strain through a clean, thin dish towel to extract the juice. Discard the leftover pulp or keep for adding to baked goods or smoothies. Alternatively, you can buy ginger juice here. Save any leftover ginger juice for other drinks, smoothies, etc. Leftovers will keep in the refrigerator up to several weeks! *Nutrition information is a rough estimate for 1 beverage without optional ingredients. ← 160 Vegan Christmas Recipes! Delicious! I didn’t have time to make or buy the ginger juice, so I just grated a little fresh ginger into the shaker. A little goes a long way! I also used both a lime and a lemon to make the citrus juice. Next time I’ll try to remember to add a Luxardo cherry before I wolf the drink down 🙄. This is my new favorite winter cocktail! Thank you! This recipe sounded too good not to try and I was happy I had all the ingredients on hand! It is totally worth the effort (and I mean pulling out the food processor to make the ginger juice)! Since I was taking this cocktail to a beach party (YES, the beach in January cause I live in Southern California – woo hoo! ), the only change I made was adding some ginger beer to make it less boozy and there fore able to drink over several hours. I used the ginger pulp leftover from making the ginger juice in our mango smoothie this morning and it was delicious. THANK YOU for another fantastic recipe!!! We rang in the new year with these yummies and they were fantastic! I had to modify a bit because the ginger juice didn’t make my shopping list so we used fresh ginger pulverized. The only down side to this yummy concoction is now I’ll have to try it again with the ginger juice! There is not a week that goes by that I don’t end up using one of your beautiful recipes. Thank you for always providing inspiration ?? Hi! I love so many of your recipes and have your ‘Everyday Cooking’ book which I use frequently! Have you thought about creating an app for iOS and Android? Just made this drink and it’s -24 outside. Great warming holiday drink, especially with the ginger. I used Canadian club and coconut syrup to replace the bourbon and maple syrup! Me and my bf loved it! Hey! Do you think this is doable for a large batch? I’m having a party and this sounds delish but I’m a little intimidated!! We made for 10 people last night and it was a hit!! Just multiplied amounts an hour ahead and put it all in a pitcher (without ice or fizzy water. Those we added to individual glasses as folks arrived). We had mint, cranberries and orange slices for garnish but the mint wilted FYI. People loved the drink! I love your blog! We made a test batch tonight – it was excellent. Maybe this is a silly question, but do you muddle with just the orange peel or an actual slice of orange? Thanks! The orange peel! Thanks for asking. Both would likely work though! Happy NY! This sounds delicious! Does the ginger need to be peeled before making it into ginger juice, or can I just toss it in the blender after chopping? Nope! Just chop and blend. Happy NY! I know I liked you, Dana. Now to find out that you are a bourbon drinker like myself, I like you even more. Can’t wait to make this – cheers! *Swoon*. Just *swoon*! And I have ALL the ingredients! Happy New Year! I too, am an older person. I didn’t even see the slight to which your other correspondent objected. You do fine work, and your writing doesn’t offend, never mind what those old bastards say. I’m with Butch on this, and i thought you handled the situation graciously. Thanks for all that you do. Can’t wait to try this!!! And, this recipe looks wonderful! Made this tonight as the temperature is dropping to the teens! 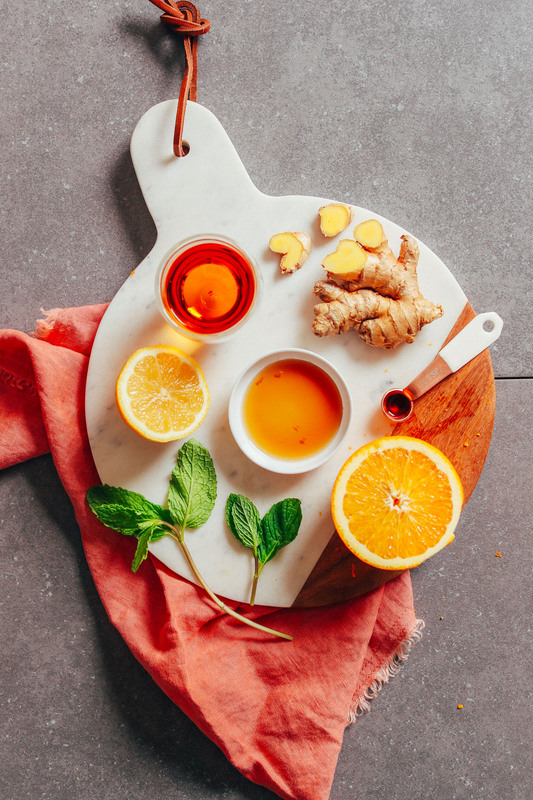 I love the warmth of the ginger, heated my body and of course it is great for inflammation – so a healthy drink!!! Just kidding! I added freshly squeezed orange juice as it seemed a little strong – however, I am a heavy hand with the liquor!!!! :) It ended as a delightful drink and can imagine with crushed ice and more orange juice as a delicious summer drink. haha, nice! You can also top with a little sparkling water to dilute. Happy NY! Sounds delicious! Wonder how it would taste if you sub bourbon for another spirit like rye, gin or white rum????. Possibilities are endless! All the best in the New Year! Sounds amazing! Let me know if you give it a try. Hi Dana, happy new year! I’m curious what all you use your magic bullet for that you don’t use your vitamix for? I’m wondering if I should buy a magic bullet in addition to the blender. Hi! I love using my vitamix or blentec for larger things, like soups, grinding oats into flour, or large smoothies. But for single serve smoothies, grinding seeds, spices, ginger or sauces, I use my magic bullet! I’m actually surprised how much I use it! It’s not as powerful as the others, but it’s great for small batch items. First, I love and appreciate your blog and recipes; the best. So it is with a heavy heart that I feel compelled to mention that your opening statement included the term “…old-person…”, which is an ageist term. Had you said “older person”, “mature person”, it would have had a different connotation. I don’t expect this to be published, but thanks for letting me express my opinion on this. I am sure many of your readers fall into the aforementioned category and may trip on your choice of term. “Isms” divide people, when we should try our utmost to unite people, especially with the many issues in the world today, and I think you are one who subscribes to this philosophy. Thanks. Gina, I’ve updated the verbiage there. Thanks for letting me know. This looks delicious! 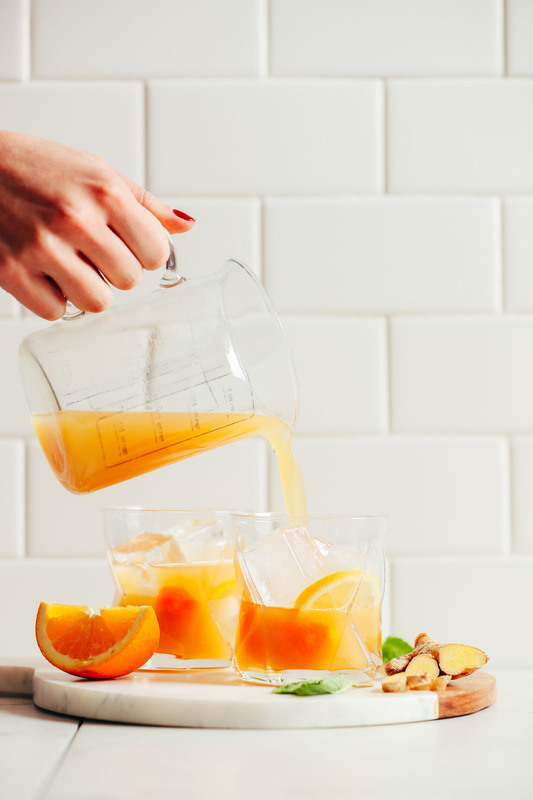 I have been eyeing those faceted glasses and the matching decanter on West Elm for a while now….I think you’ve convinced me to buy them!